Sometimes, I get comments about recipes not being super “healthy” or completely from scratch, so I just want to put this out there – I have never claimed them to be. If you can make every meal, every day from complete scratch, I am in awe. I give you kudos. I also wonder – How do you do it?! Where do you find the time, or money, or patience? You are the imaginary unicorn to me. Is there no boxed food or frozen bags of food in your house? Because we have at least 1 frozen pizza in our refrigerator at all times. I mean, don’t get me wrong. I love home cooked meals where every piece is from scratch, but I just can’t always do that. I don’t have the time. Between running and trying to grow different elements of my business, plus trying to get healthy and have a life, I often lose sense of time. There are days that Cap walks in the door, and I think “Oh crap! I didn’t get anything out for dinner.” Also, it’s expensive. Eating clean or organic and making everything from scratch can be really expensive. Lastly, I am just too tired sometimes. That sounds lazy, but at least I am being truthful. I honestly believe that I am not alone in this though and that most of you don’t have it together for all home cooked meals from scratch either. Or that many of you don’t necessarily care about being totally “clean” and from scratch – like me. So that is why I share some of my cheater meals with you. 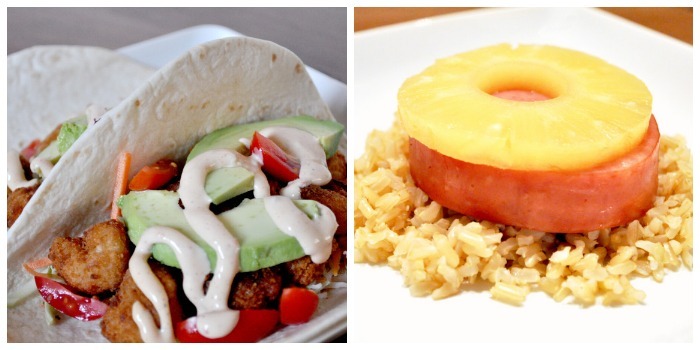 “Cheater meals” to me are ones with easy prep and quick turn around. They also usually include a short cut somewhere in the mix. For example, when making our Hawaiian Ham, I normally use a bag of Bird’s Eye Steamed Brown Rice and canned pineapple. When I make the Crispy Shrimp Tacos that I am obsessed with, I use frozen popcorn shrimp, a bag of broccoli slaw, and a contained of Kraft Southwestern Ranch. They may not be from scratch, but we love them over here! 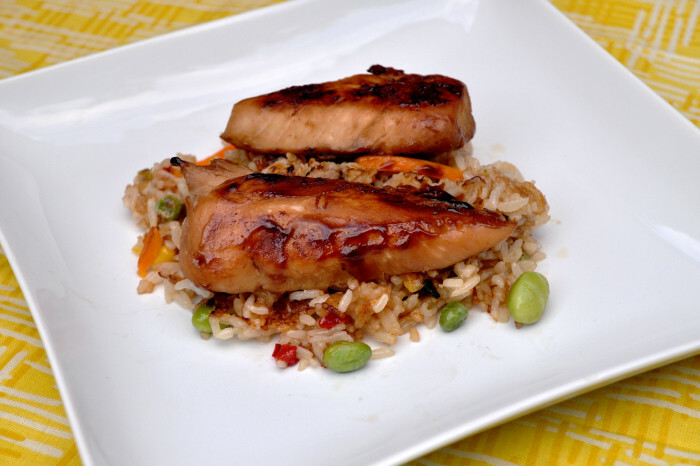 I will continue sharing Cheater Meals here at The Love Nerds that I hope will help all of you on the days that get away from you, like this recipe for Chicken Teriyaki with Vegetable Fried Rice. On our very first trip to Trader Joe’s a couple weeks ago (I know, I’m late to the party), I bought a bag of their frozen vegetable fried rice. I decided to cook it up with some Teriyaki Chicken, and it was amazing!! It was ready in under 20 minutes and tasted delicious. I will definitely be picking up another bag of their vegetable fried rice the next time we go. 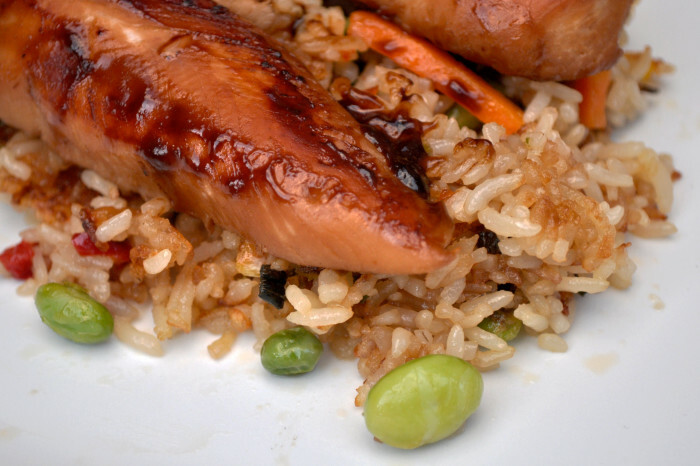 Clean your chicken and then marinate in Teriyaki sauce. I only marinated mine for 15 minutes. In a skillet, cook your chicken until no longer pink in side. I was using chicken tenders and this took less than 15 minutes because they weren't super thick. I used a lid while cooking to keep the chicken moist and added a little extra teriyaki to the pain halfway through for added flavor and moisture. While the chicken is cooking, cook the vegetable fried rice in a different pan using the directions on the package. My tip is to press the rice down and let it cook for a few minutes at a time to get the rice nice and crispy. DONE! I love the fact that this recipe only has three steps, plus it tasted amazing. Bryan and I actually stopped talking part way through dinner because we were eating our food so intently. I hope you will see past using a bag of frozen vegetable fried rice and give it a try. It is simply the best frozen foods item I have ever tried! It’s made ma a Trader Joe’s believer. This is my family’s kind of meal. 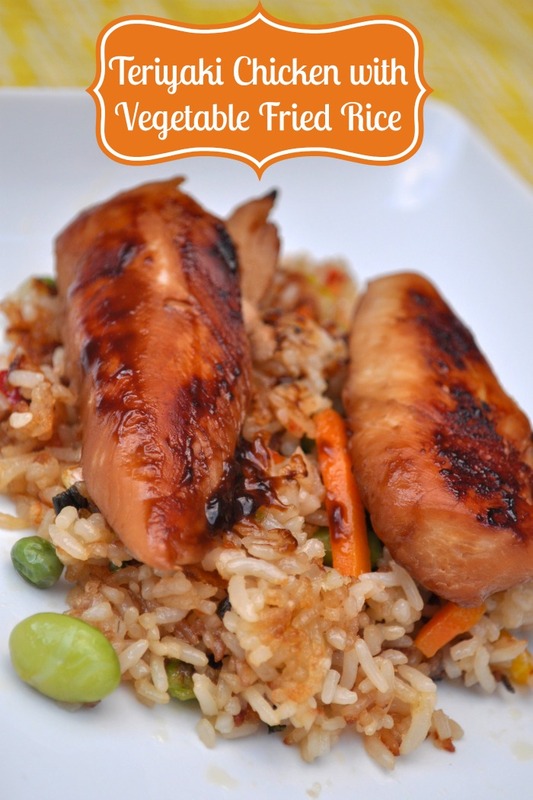 They love Asian dishes like chicken teriyaki, and I love how easy it is to make! Thanks for sharing!! I too don’t have the time, money or patience to make everything from scratch so I appreciate easy meals! This looks delicious!